Audrey Magee worked for twelve years as a journalist, and has written for, among others, The Times, The Irish Times, the Observer and the Guardian. She studied German and French at University College Dublin and journalism at Dublin City University. She lives in Wicklow with her husband and three daughters. The Undertaking is her first novel. Thank you. I am acclimatising. A writer is, at heart, a quiet kind of character who likes to hang out with her own thoughts and mumblings, so that it is a little odd to think of strangers tucked up in bed or curled into the sofa reading your work. But wonderful too. And very humbling. Has anything particularly surprised you about the novel’s reception? The strength of the response, and the reader’s willingness to consider the second world war from a different perspective. The title of the novel refers, I believe, to the marriage of convenience between the two main characters. Is such an arrangement based on fact and, if so, how did you discover it? Yes, it is. I was at dinner in a restaurant in remote west Cork, when the owner, a German man, joined us at the end of the evening to talk about his time as a soldier on the Eastern front. He talked of how he had married a woman he didn’t know to secure leave from the front, while his new wife got a pension if he was killed. Thus began The Undertaking. 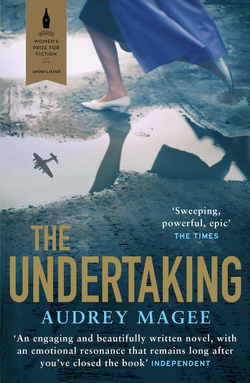 The Undertaking tells a familiar story of the impact of the Second World War on ordinary people from the less familiar, at least in the English-speaking world, German perspective. What drew you to this particular telling of the story? I went to Germany in the mid-1980s when I was 18, when there was a shroud of silence over the war, over the Holocaust, and I became fascinated by that silence, by the obvious pain, guilt and anguish of the ordinary German. I very much admired how, through the small – and larger – acts of cruelty carried out by characters we’ve come to care about, the reader is put in the position of almost colluding with the Nazis. Was this your intention? Yes, it was. The Second World War had been parcelled into a very neat package of victory and defeat, of us and them, of John Cleese goose-stepping across our television screens, shouting ‘don’t mention the war’. But after my time in Germany, after Bosnia, Rwanda, even Northern Ireland, it didn’t seem to be as simple as just blaming ‘them’; humanity’s inhumanity was everywhere, it was in us all. So I asked the question, what would I have done if I had been German at the time? What would you have done? There are very few Schindlers among us. The novel is strong on dialogue, almost like a radio play. Were you conscious of this in the writing or did it just turn out that way? Funny, I didn’t think of a radio play, but I did write the novel as though it were a piece of theatre because I wanted the reader to engage as the audience does during a play, dependent on dialogue, picking up nuances from what is said, from what is unsaid. There is no omniscient narrator in The Undertaking to direct the reader’s thoughts and emotional responses; the novel unfolds as a play does, creating a space for empathy to creep up on the reader. What did you most enjoy about writing The Undertaking and what did you find most challenging? I am not sure that there was much to enjoy as it was a very difficult space to inhabit, but I did relish the challenge of the writing style I had chosen for the novel. In what way does your experience as a journalist help or hinder your fiction writing, and did it impact on your path to publication? I saw so much of the world through journalism, usually its worst aspects, sometimes its best, and I drew on many of those experiences while writing The Undertaking. But I did have to dismantle my more formulaic journalistic writing until I found my own style, my own way of doing things. I am a slow writer. Very slow. Everything is considered, written and re-written. To do that, I need a very quiet, routinised lifestyle. And a lot of tea. Colm Tóibín warned me to be patient, that publishing was a slow business. After the speed of journalism, that was good advice. Bad advice should be quickly forgotten. What drives you as a writer and keeps you going when the going gets tough? That what you are doing matters. If only to yourself. It’s been a pleasure. Thank you.